Gose: where it comes from, the appearance, flavour & aroma, palate & mouthfeel, food pairings and serving suggestions are all explained in this Beer Styles 201 article. Gose is a top-fermented beer that is brewed with at least 50% of the grain bill being malted wheat. Gose beers are brewed with salted water. This results in a slightly salty, sour, puckering taste. Gose are unlike any other style of beer in the world. Gose is spiced with coriander, in addition to hops, which is a spice that is technically forbidden by the German Beer Purity Law (Reinheitsgebot). It required an exception be made for Gose to reclaim its former glory after German reunification. in 1989. Gose is pronounced like “Goes-Uh”. While the pronunciation of the name leaves you sounding a little like Homer Simpson “duh”…the taste is like no other beer style you’ve had. 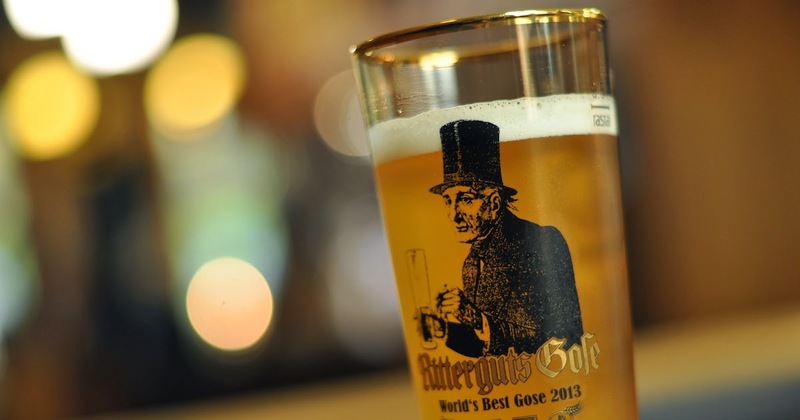 Gose originated in Goslar, Germany, but is now associated with Leipzig. Gose often comes out with a dark pale to light amber colour. After pouring, the brew develops a tall, slightly off-white, lacey, and substantial head, which stems from the high protein content of the wheat. This is a sour and salty tasting ale. Gose nose is mild and subdued, with no hop notes, and just a whiff of spicy coriander. There is no upfront bitterness that is saved for the finish. The middle is dominated by an almost sour spiciness overlaid by a complex array of banana, green apple, dried apricot, zest, and coriander. These tastes make the hops in the brew almost imperceptible. The finish is crisp, dry, almost mouth-puckering, and very refreshing. The brew has a medium, pétillant-style effervescence and a medium mouthfeel. What foods pair well with a Gose? This distinct beer requires a distinct-tasting food pair like seafoods, such as a filet of blue fish, a morsel of smoked salmon, or a plate of oysters on the half-shell. With more brewers making more kinds of beers these days, we now enjoy a mixture of historical and modern creations. Where did these styles come from? Czech Pilsner, German Pils & American Pilsner: where they come from, their appearance, flavour & aroma, palate & mouthfeel, food pairings and serving suggestions are all explained in this Beer Styles 201 article.